My secret is out, inspirational notebook is published!!! When Chrissie was at Clasheen for the official launch of ‘From Felt to Friendship’ last month I mentioned to her that I was in the middle of designing a simple little notebook to jot down my musings in. Well finally tonight my secret is out, the book is published and available to order through Blurb!!! Chrissie herself actually published her own ‘Feltingfibres Inspiration Notebook’ recently, you can imagine how silly I felt when I had told her what I was up to and didn’t get it together until now, ah well, better late than never! Basically ‘inspired by nature’ is 80 pages long, has a mixture of blank, lined and graph paper pages and features a selection of inspirational photos I’ve taken around Ireland during September this year. I’ve ordered a batch of them to have to hand, you may have guessed how appalling I am at keeping all my paperwork in order, I’ve no excuses now! Here is the preview, enjoy! Apologies for not posting final pictures from the weekend’s free machine embroidery workshop yesterday, tidying up just got in the way! Seriously, the massive back kitchen/garage restructuring that I have undertaken this week is really coming along famously and I didn’t want to break stride and get sidetracked by the computer, I would NEVER have headed back to the devestation that is my garage otherwise!!! My mother’s birthday in on Sunday and she has requested a companion piece to the little rose hip vessel (one of the pieces in ‘From Felt to Friendship’) I gave her for Mother’s Day earlier in the year. Luckily she requested this ages ago (as she requested the original vessel!) and I was able to put some orange, red and black merino aside in a bag so fingers crossed I can make a nice piece this morning, a welcome change from all the tidying and cleaning going on chez Clasheen! This afternoon I am playing in the last big ladies golf competition of 2011 so thinking of this I have put aside this morning for felting the vessel and hopefully a couple of new bracelets to stitch at the weekend. I really feel that because I have invested so heavily in my machine I need to get to grips with the technicalities pdq because I obviously need to be selling work to justify the initial cash outlay. My intention is not to stitch every piece of felt from now onwards rather understand the possibilities and see where that leads me! 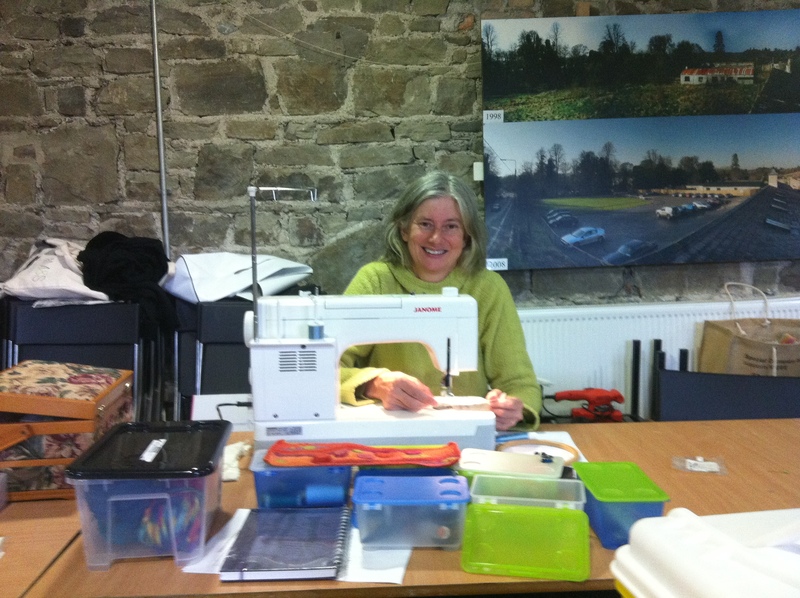 Now on to some more pictures and info from Arlene Shawcross’s brilliant free machine embroidery workshop last weekend. On Saturday evening when I returned home after the first day was over, I had a look in my studio to see if any of the beautiful glass buttons I brought home from the Sheep and Wool Festival in Rhinebeck last October would suit the colours of the bracelet which I had been stitching. 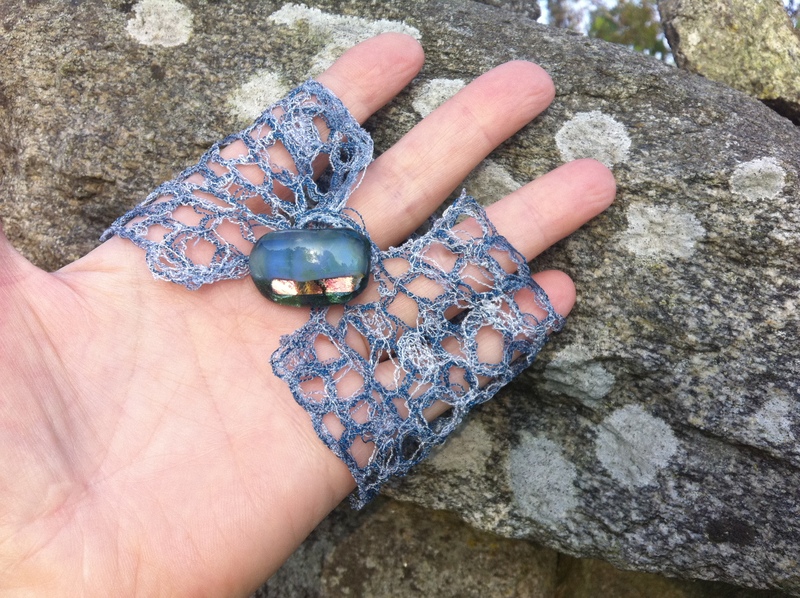 The loop closure is not the widest because I felt I needed to keep it in proportion to the delicacy of the stone wall design so I was delighted to discover the smallest of the buttons was a beautiful grey/blue glass with a band of deep green and iredescent gold, perfect. It was a bit (or a lot fiddly!) to attach the button and after a failed attempt myself I have to confess that Arlene was brilliant and stitched it on for me, thanks Arlene! Big strong hands are a huge advantage sometimes (excuse the pun) but for some jobs especially ones involving detailed sewing I just get very frustrated, ah well, one step at a time I suppose. 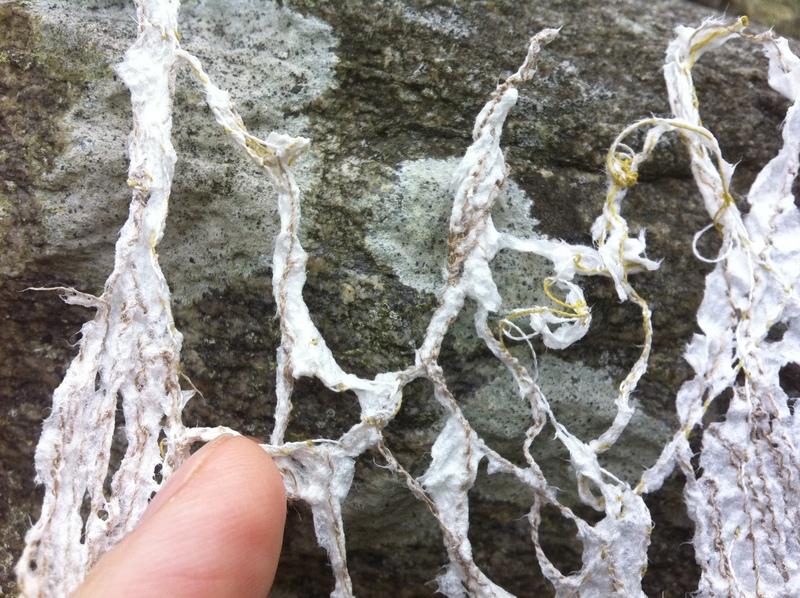 My next experimental project was to stitch on a dissolvable paper, very interesting. Arlene has gorgeous samples and I thought this would be a very interesting way of creating interesting pieces to sandwich between two layers of perspex or glass, my mind was humming! With this method I didn’t need to cross over each line of stitches to the same degree as I had with the Romeo, the second stage of the process is wetting out and removing some of the paper so being selective with this ensures that the remaining paper ‘bonds’ everything together anyway. Adding paint to your brush and washing it lightly over the surface of the stitches and paper leads to interesting effects if you don’t make it too wet, as the water/paint dries the remaining paper stiffens around the stitching. I loved this distressed look and will be experimenting further, below is an image of one of the pieces that I made. The final piece that I created used a very sticky backed plastic, problems, problems with this one but a very impressive final result even if I do say so myself! I’m going to add a few selective beads to this piece, frame it, photograph it and then blog about it so until then I’m not going to write any more about it here. 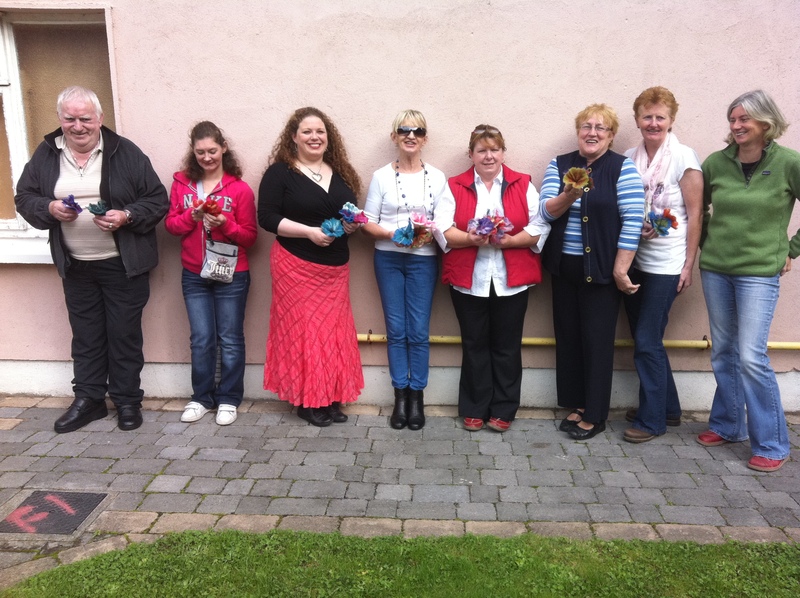 New felt bracelets, free machine embroidery workshop and the 2011 Irish Web Awards! It’s a busy time here at Clasheen but I do seem to be managing my time a little better than usual, thankfully! 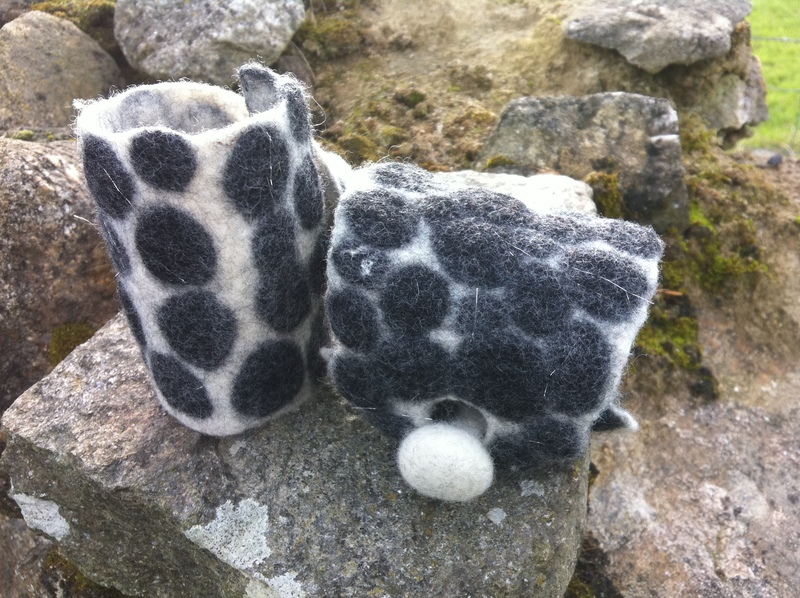 As promised here is a picture of the two dry stone wall inspired felt bracelets I made at Niki’s last week, the bracelet on the right I kept for myself and the one on the left has just been added to my Big Cartel shop. It has been interesting hearing the reaction of everyone who has seen these two pieces together, with the exception of one friend and myself, everyone has choosen the one on the left hand side as their favourite. This leads me to believe people find the larger white surround of the stones appealing, whatever, I love them both!!! I spent a wonderful two days over the weekend participating in a workshop with the South East Textile Group. Our main focus for the workshop was free machine embroidery on various types of dissolvable fabric or paper but for me the biggest result was getting to grips with my Janome straight stitch machine and feeling comfortable with the results! Our tutor was Arelene Shawcross, an English lady now living and working from Macroom in Co. Cork. Arelene was an excellent teacher, I would highly recommend sessions with her for anyone interested in exploring free machining further, her manner is informed, relaxing and highly productive. There were loads of interesting samples for everyone to examine and exclaim over. For me the beauty of Arlene’s embroidery was most visable in some subtle tone on tone work, I don’t find highly coloured pieces as attractive to my eye but definitely there was something to suit everyone in the work on display and we all got inspired and ready to get down to business quickly. Stitching on Romeo, is that a smile??? The first sort of soluble fabric that I decided to experiment with was a thickish plastic kind of one called ‘Romeo’. Following on with my dry stone wall obsession I wanted to keep my work subtle and elected to stitch a bracelet (after a couple of small sample pieces!) using soft shades of silver, grey and blue machine embroidery threads. The top two tips that I learnt over the weekend were that it is important not to have the presser foot (free machine or darning) down against the fabric you are stitching on and that you can use machine embroidery and metallic threads on top and in your bobbin if you follow this rule, magic!!! You may remember I was having problems with my metallic thread breaking constantly when I last stitched into felt, changing to a new needle and following the above tips worked like a dream, I tried stitching into some very thick felt after I had finished the bracelet and no problems. Following is a picture of the bracelet pinned to some polystyrene prior to dissolving the plastic, images of the finished piece tomorrow! 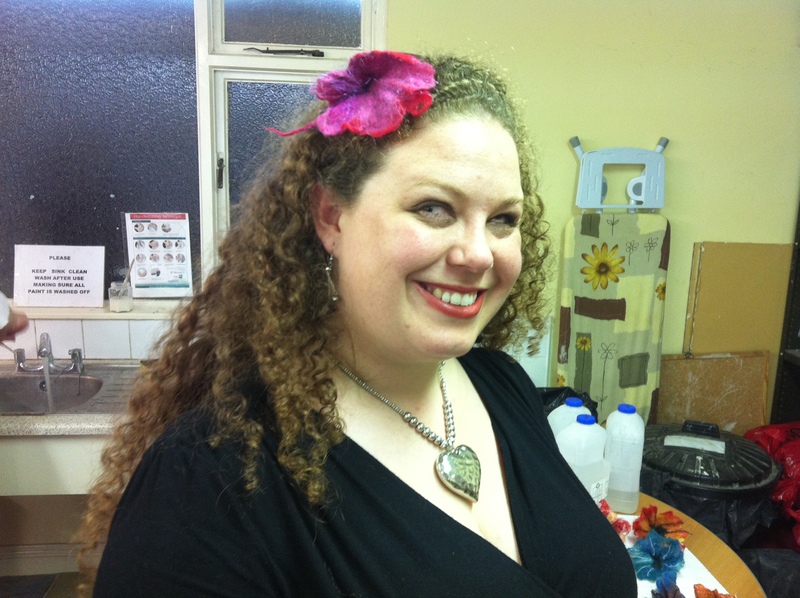 Finally a big thanks to Cathy for nominating this blog for a 2011 Irish Web Award, YAY! 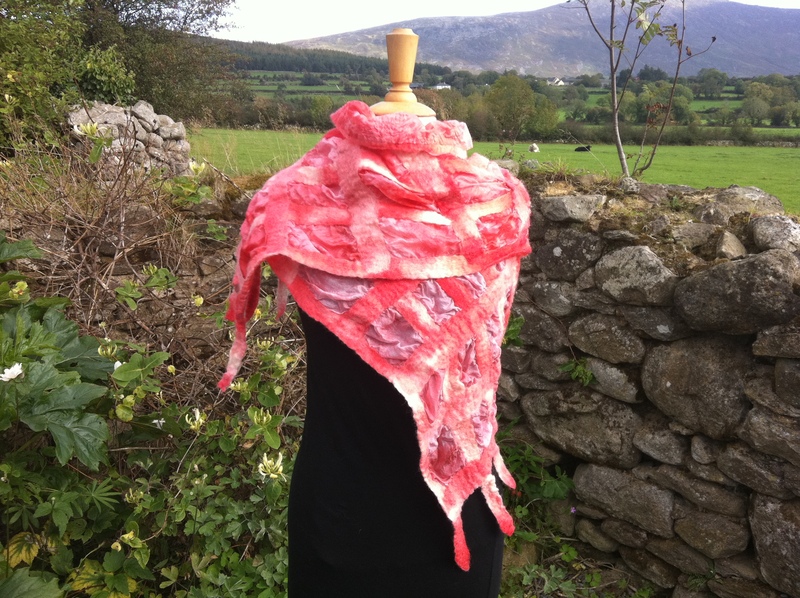 Nuno felt scarf and wrap pics at last! Today I managed to take some pictures of the nuno felt scarf and wrap I felted using some of Kool-Aid dyed merino and ponge silk from the weekend. No, we don’t have Kool-Aid here in Ireland but I am lucky to have a good US friend who knows I love it (NOT to drink but to dye with!!! ), thanks Kristi! It’s also on my ‘to buy’ list when I visit Jamie and Blas, Sharon and Emma, Dawn and Jan, the special friends who are so good to host felting workshops on my amazing trips across the water. Incredibly, not only have I taken pictures of the two pieces but I also managed to revisit my Big Cartel online shop and get them listed earlier this afternoon. Woo hoo, finally I have some items for sale again and not just languishing in my wardrobe! I am also just about start a new page to update all my links and let you see which websites and blogs I follow, for today however enough is enough, I need to cook some food now and have a tasty supper!!! I spent a wonderful time with friend Niki Collier, her husband Rem and their beautiful children Coral and Tanya in Dublin yesterday. Niki and I had a felt filled day planned, inspiration, discussion, chat and action, it certainly lived up to and surpassed all my anticipation! 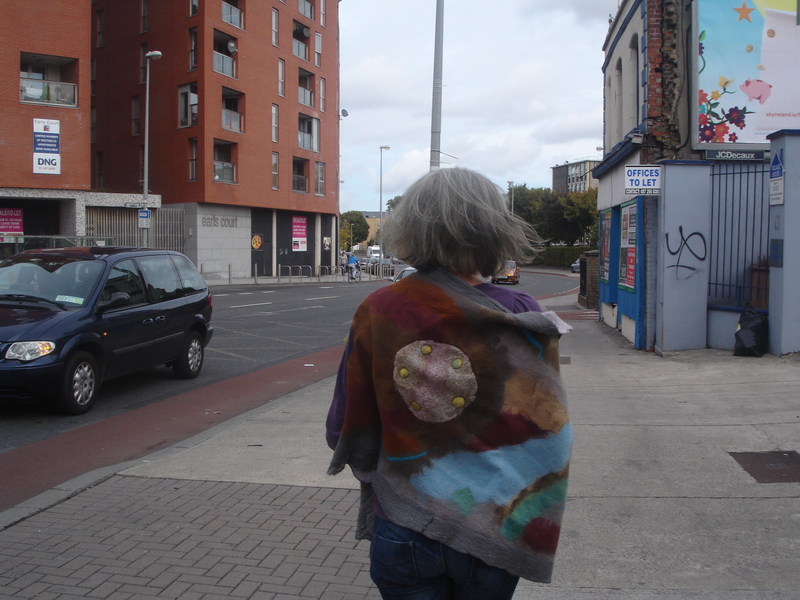 During the day we walked to collect the children from their respective pre-schools and this was an opportunity for me to wear and Niki to photograph the stunning piece she felted at the recent Dublin Pam de Groot workshop organised by Feltmakers Ireland. Initially this softly draping nuno piece was designed to be worn as a long shift, once I tried it on and looked at myself in the mirror I asked Niki would she mind if I tried it on with the intended neck opening as an armhole, voila, this incredible wrap was born!!! 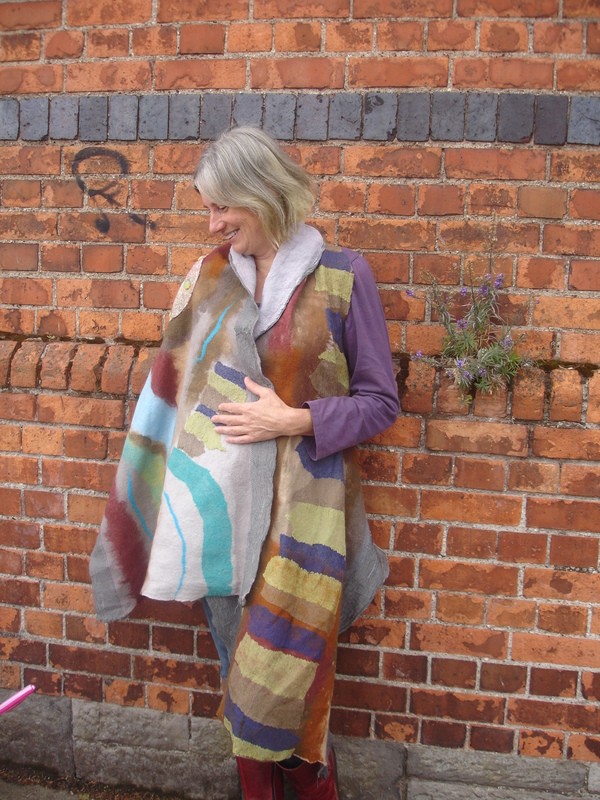 We had great fun chatting and pausing as we walked along and it was totally fitting that the wrap was photographed in the urban landscape that was its inspiration. 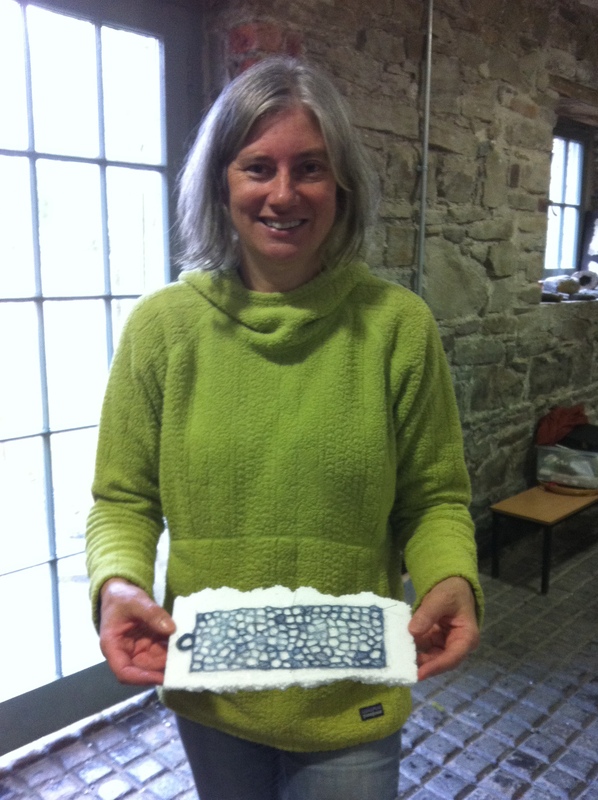 Congratulations Niki on a very special piece!!! During the afternoon Rem took the children out for a while and Niki and I settled down to our felting. I’m thrilled with the two new bracelets I made and promise photos tomorrow, they are the first in a new series of work I’m creating inspired by Irish dry stone walls. In the evening our felting friend Sheila Ahern joined us right on time to watch this weeks episode of Craft Master, a current Irish television series focusing on craft in Ireland. Sheila is involved in the production of the series and her official title is ‘Craft Advisor’, Niki and I thought the programme was excellent!!! Alan travelled up from Bagenalstown to join us for dinner and we had a wonderful meal, the highlights included a yummy salad accompanied by a Bulgarian speciality drink (unfortunately I can’t remember the name, maybe I drank too much! ), stuffed aubergines, seasonal vegetable stir fry, roasted tomatoes with garlic and a fantastic tasting fillet steak for the meat eaters, it was a meal fit for a king! Little Tanya is making me smile! 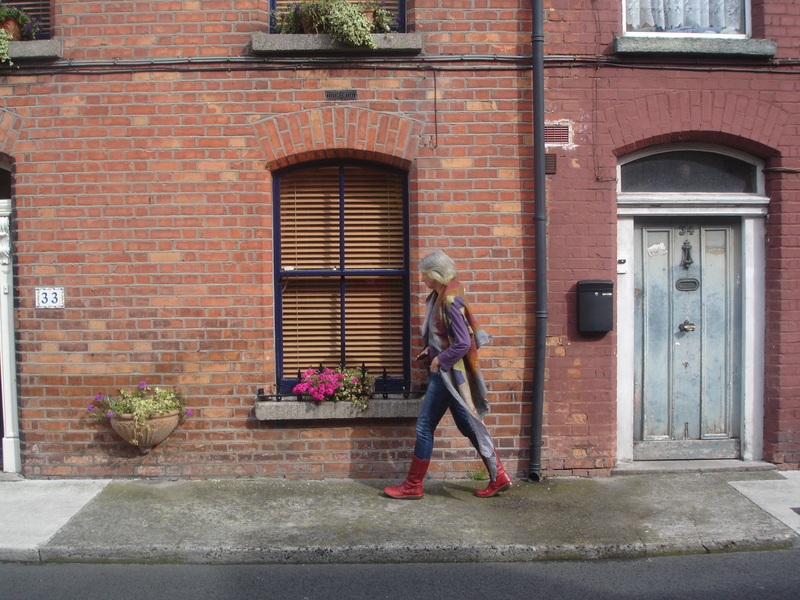 Today I headed back to Niki’s in the morning to collect my truck and have a good cup of coffee (I stayed in Alan’s Dublin pad for the night), after that I drove to Ikea to make some final choices for my utility room/back kitchen. This part of the house has just not been working in its current layour so over the next week I am going to dismantle all the units, drag them out to the garage and reinstall, then I get to have fun putting together and finally fitting what I hope will be the work space from heaven, I’ll update you as it progresses! Unfortunately this does mean that I won’t be going away for a short holiday with Alan as we had planned, he just can’t get next week off but luckily we hadn’t booked to take account of this eventuality occuring. Ah well, he did suggest he MIGHT wrangle two weeks off at the beginning of November so I’m not totally ruling out a holiday yet, for the moment I’ll live in hope! 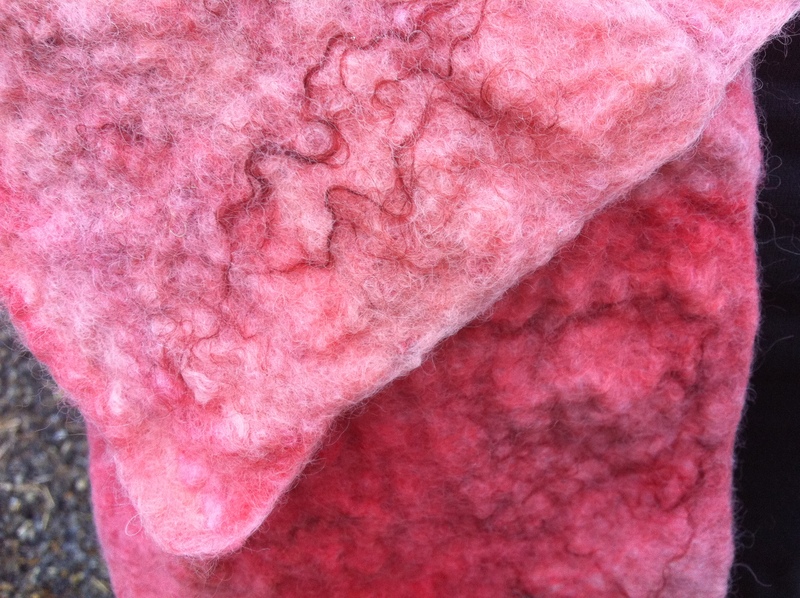 Kool-Aid dyed ponge silk and merino roving = nuno felted scarf! Yesterday I spent almost all day dying merino roving and ponge silk in the microwave using a variety of Kool-Aid colours/flavours, check out my Facebook page to see some pictures of the work in progress. Although I am not going to go through a step by step discussion of what I did here tonight (still a couple of leaves to felt before I head off to bed, more another day!) I will leave you with a close up shot of the nuno scarf I felted yesterday evening. I just couldn’t go to bed last night without getting my hands stuck into all that yummy coloured fibre now, could I??? I also felted an optional flower brooch to compliment this scarf and as soon as out weather picks up a little I’m going to take some photos of them as I want to upload it to the internet for sale, my shop has been totally quiet for far too long now!